relies on a combination of clinical and biochemical parameters. very effective or durable in this patient population. treatment is critical and involves improving the way opioids are prescribed. 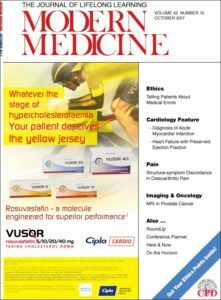 We welcome you to come and read through our latest, October, edition of Modern Medicine. This month we have a jam packed edition for you. Our features this month include; Ethics, Cardiology, Pain and many more. of the prostate is still evolving and is not without limitations. increasing age of the population and increasing incidence of risk factors such as obesity and hypertension. features is key to diagnosis. The diagnosis can be confirmed with exercise right heart catheterisation. at present. Active research is under way to develop appropriate diagnostic and management strategies. treatment strategy; these scores may be useful for GPs as well as in the emergency department.